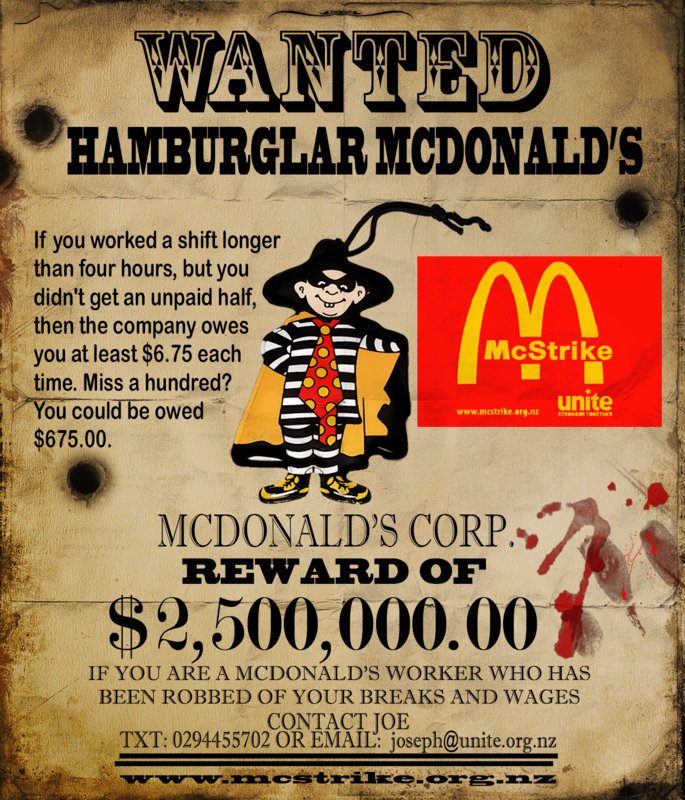 Unite Union discovered recently that McDonald’s has been breaking the law over breaks. In out attempts to fix the problem we have run into the legal might of a wealthy corporation and its contempt for “good faith”. This is an important issue as the government is removing even the modest protections that exist in the current law on breaks and leaving everything up to the employer to decide – so long as they are “reasonable” of course. The current law says that all employees become eligible for a 30 minute meal break once they have worked four hours. Our collective agreement has an added clause that if this is missed then the worker should be paid an additional 30 minutes as compensation. We discovered that the company has been routinely working people over 4 hours but not rostering a meal break. If they do get a meal break it is often scheduled as little as one hour after starting the shift – again in breach of the law which stipulates it must be mid shift unless there is agreement otherwise. Our members were never given the option of agreeing or disagreeing. Friendly managers gave us printouts of the hours worked by all staff in two stores. One was a McCopco store owned directly by the US parent and the other store is owned by a franchisee. All waged employees have to clock out and back in for their meal break but this does not apply to the shorter breaks. The reports clearly show that workers were routinely not being given a meal break if they were working shifts of more than four hours. It also showed that supervisors were regularly cutting their own breaks short because of short staffing. Neither group was compensated. We asked the company for similar records for all our members. They claimed they were virtually impossible to access, located in Australia and would amount to millions of pages. They then said that they would only supply them if we got individual authorisations from each member and that we would have to approach each franchisee separately as well. They have never demanded this additional authorisation before when we have requested wage and time information. We believe this is an additional breach of the law. We applied to the Employment Relations Authority to enforce the law and the collective agreement and have a mediation set for today. Then last night we received a letter from the company’s lawyer which claims that the collective agreement we have operated on for the last two years was not legal because the company hadn’t signed and returned the copy signed by the union that had been sent to them and the law requires it to be signed by both parties. This has never been raised before. We also have email exchanges confirming the document and a joint presentation from the company and the union that was taken out when it was voted on. And the company has claimed to be abiding by it for the last two years. Today we have mediation on the issue. We will not let their legal shenanigans get in the way of our claim. We estimate it could cost the company $2.5 million so I can understand they are be worried. But I will be making it very clear to company that Unite Union is not going to be intimidated. We have a great lawyer and he is confident we can challenge and turn back all their legal tricks. If they want to try and claim the collective agreement agreement doesn’t apply then they may well discover that they have opened a Pandora’s Box because the constraints will also be off as far as Unite is concerned. More importantly we have the court of public opinion that will be making its judgement on this corporate thief which sacks a worker for putting an extra piece of bacon on a burger but hides behind lawyers when if comes to workers being robbed of millions of dollars in entitlements. I was in an elevator with a senior gambling executive five years ago. It was a few days before John Key ousted Helen Clark’s government. We chatted about what might happen in the gambling industry if National became government. He surprised me by claiming Key would be Tourism Minister. My lift companion smiled when I responded that a prime minister doesn’t take on a portfolio traditionally delegated to a junior cabinet minister. He winked that Key was committed to the “leisure” sector in its broadest sense. A few weeks earlier, a SkyCity senior manager had said something similar about tourism, that it and gambling were bedfellows. A few days after Key’s election victory party – at the SkyCity casino – the new Prime Minister did, indeed, appoint himself to the post. It seems gambling bosses do not bet their fortune on chance. In my view, Key has worked closely with gambling bosses, and the extra pokies-for-a-convention centre deal should have disabused any doubters of that. But the gutting of Maori Party MP Te Ururoa Flavell’s private member’s bill to control gambling is something even the most optimistic gambling owners could never have expected. Flavell’s humiliation was compounded by a plaintive plea that anything was better than nothing. I struggle to see what the “anything” he actually got was. The bill’s original intent was to stop pokie machines raking in cash from poor communities and to give local councils the power to close or downsize pokie venues in those areas. National deleted the proposals from the bill. Stunningly, National went further and amended the bill to remove the current nine machine maximum for pre-2001 operators. Pokie owners will now be able to provide more gambling at existing venues as well as giving them a commercial advantage over any newcomers. Flavell’s bid for 80 per cent of pokie profits to be distributed in the communities the money comes from was tossed out too. Money will be taken from poor communities and, as happens now, distributed to wealthier neighbourhoods. As a laughable compromise, National will hope to raise the donations from the current 37 per cent to 40 per cent in two years’ time. 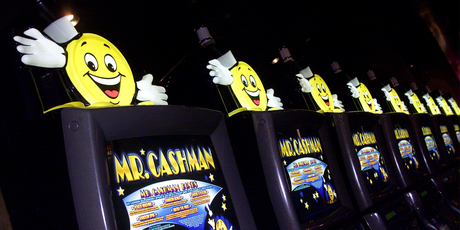 Suggested controls on addictive gamblers have quietly been omitted. National knows that the Maori Party must do well in the Ikaroa-Rawhiti by-election this Saturday or they are finished. The Maori Party has been left desperately trying to convince Maori voters they aren’t National’s poodles. Frankly, Flavell would have done more for his leadership ambitions and his party’s electoral chances if he’d publicly told National to shove their amendments. Instead, he has accepted them. Is it any wonder National will be left with no electoral coalition partners in a year’s time? Trade union leaders have promised co-ordinated action against government spending cuts as thousands of campaigners gathered in central London. The People’s Assembly – a coalition of unions, politicians and activists – said ministers were “deaf” to the concerns of ordinary people. More than 4,000 people gathered at Westminster Central Hall on Saturday. Unite general secretary Len McCluskey said anti-union laws should not get in the way of strikes against austerity. The UK’s biggest union earlier released results of a survey suggesting many people have employment or money worries and want the government to concentrate on growth and jobs – even at the expense of cutting the deficit. Mark Serwotka, who leads the civil service PCS union, called for co-ordinated civil disobedience, protests and strikes. Addressing leaders of all political parties, Mr McCluskey said: “If it is right to strike against austerity in Greece, in Spain, in France, then it is right to strike against austerity here. 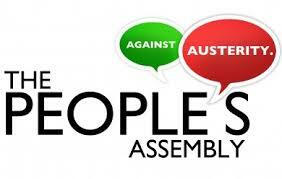 Over recent months a series of People’s Assembly public meetings have been held across the country. Green Party MP Caroline Lucas told the BBC the meetings were intended to mobilise people against the government’s “economically illiterate” polices. Also present were Labour MPs, film director Ken Loach and columnist Owen Jones. Labour leader Ed Miliband earlier told his party’s policy forum it would not borrow to reverse the coalition government’s spending cuts. Francesca Martinez is an English stand-up comedian and actress. She has cerebral palsy but prefers to describe herself as “wobbly”. West Auckland McDonald’s strikes build momentum as picket lines swell and striking workers triple in number. Workers walked off the job at three McDonald’s restaurants in West Auckland last night to picket their bosses most profitable restaurant. Numbers swelled as workers walked off the job and went store to store, gathering workers and momentum along the way to converge on the mouth of the Kelston McDonald’s drive through. The drive thrus at McDonald’s New Lynn and Kelston were hit with pickets, costing the company thousands of dollars in sales as customers turned away in support of the workers. McDonald’s workers of New Lynn, Lynn Mall and West City McDonald’s, unhappy about being paid less than other fast food and fed up with their treatment at work, were joined by ex-employees and supporters at the picket line at Kelston McDonald’s. Unite Union has been surveying workers at all five restaurants owned by West Auckland franchisee Dinesh Mani and has found workers are not getting breaks, missing pay and being bullied and harassed by management on a regular basis. Striking workers approached customers at their car windows, spoke with them about the campaign for equal pay and working conditions, asking them if they “wouldn’t mind eating somewhere else. 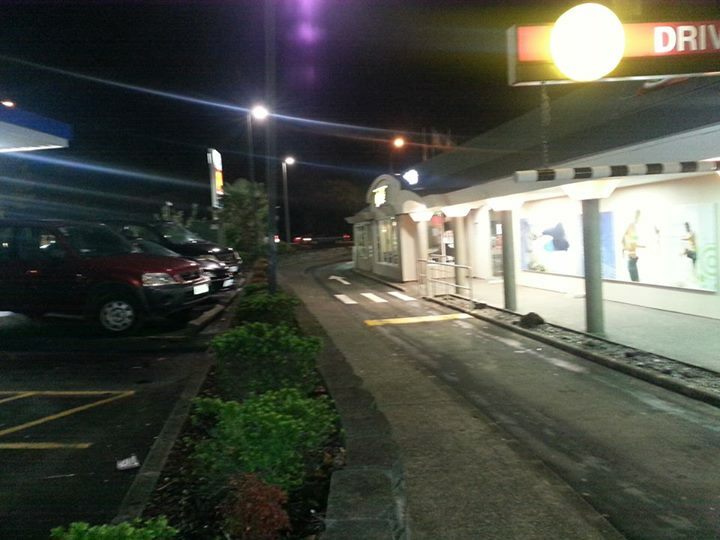 “F**k McDonald’s” and “go hard, I hope you win”, were common responses as the vast majority of West Auckland customers turned their cars away, honking their horns in support. “Kelston McDonald’s is the only McDonald’s restaurant out West selling Georgie Pies and with all the advertising hype surrounding the return of Georgie Pie, we weren’t sure how customers would react to being asked to eat somewhere else”, said a worker of New Lynn McDonald’s. “We knew most of them were headed there to buy Georgie Pies. The drive through was jammers on arrival.” Not for long. The Striking McDonalds workers of West Auckland keep spirits high Thursday night and turn away the majority of cars from Kelston Drive Thru, in solidarity with their fight for fair pay and respect. 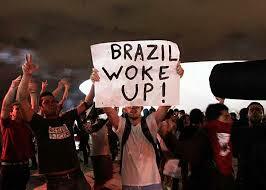 The revolts in Turkey and Brazil are truly inspirational. The Anglo-Saxon world seems to suffer too much acceptance of the status quo but I’m sure our day will come. 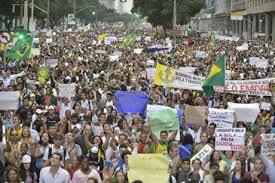 The Occupy movement was a sign that maybe that won’t be too far away. Like the Indignados in Spain a few years ago there is a an emerging broad challenge to that status quo. There is a desire to reclaim the power of being a citizen against the power of the 1% who seem to have captured official politics and the main parties of the right as well as the traditional social democrats. People want “something different” but what that is seems elusive. Except for Greece it seems that even the radical left haven’t been able to capture the imagination of people or their confidence that they have the answer. The metrolpolitan centres have grown into megacities of enormous complexity. Millions of people don’t have traditional jobs but exist in the pores and margins of society. The vast majority are excluded from any real decision making or power. Part of the mass protests, the central square occupation etc have been “assemblies” to provide alternative directly democratic methods for engagement in politics and society by the excluded majority. I continue to believe that the alternative that is instinctively being sought is some form of democratic, cooperative, socialist society. Given the problems the planet is facing nothing else makes sense. But the traditional left from either the social democratic or Stalinist traditions have nothing to offer for this vision. Even the left social democrats share a “Statist” approach to politics which has the liberal do-gooders fixing things for the ignorant masses. They think politics is the State doing things for us rather than empowering people to do it for themselves. Stalinism is simply the most grotesque form of this type of politics. A radical socialist vision today must include ways of empowering people today – not waiting until “after the revolution”. There will be no fundamental change in society until millions of people are engaged directly in challenging the system and building alternatives to the system in the here and now. We must re-look at ways of organising communities that empower people to tackle problems in their daily struggle for existence. That must include worker cooperatives, community gardens, popular education, cultural and sporting programmes. In New Zealand we are blessed with elements of this in embryo with the Maori marae. We can learn from Maori how to organise communally and locally. If the Mana Movement has a say in the formation of the next government we could demand the government allow the creation of a communal council centred on a school or group of schools in an area – just as Act got their charter schools implemented. The school could become a marae with all the people in the area electing a communal council to run it. We would resource the council to have a community garden, community health centre, citizen advice bureau, legal aid services. It would have a threatre, a sports complex, gymnasium and swimming pool – open for the whole community. It would run night classes on whatever people wanted to learn about. Old people could volunteer as tutors in the school and help with the gardens. It could have a communal kitchen for teaching and producing meals for the school kids and the community. It would have childcare facilities and before school and after school care. We also need to explore developing worker cooperatives that can meet the needs of the community. A house building or renovating co-op would be a good place to start. But we don’t need to wait for the government tor resource such initiatives. We need to be imaginative in doing whatever is possible in our neighborhoods, schools, universities and workplaces that empower and strengthen people at the grassroots. Look to the community gardens, Kohanga Reo’s and Playcentres of today for inspiration. Visit a marae! People want to be part of a community. People want to contribute whatever skills they have to improving their community. Usually we never even meet our neighbours let alone get to know them. We live an alienated existence. Everything is run as separate bureaucratic operation. Health care, education, housing, jobs, food production and consumption are disconnected from each other. This is the character of capitalist society which runs everything as a business that must return a profit to a private owner. But even state provided services mimic the capitalist model. But you can’t fix health without fixing housing. You can’t fix education without eliminating poverty. Capitalist society is heading ultimately towards a social, economic, and ecological catastrophe for the planet. Ultimately we do need to replace it with a cooperatively owned, democratically controlled and planned economy so that human needs are placed before private profit. But we need steps that empower people in today’s society so people can develop a confidence in their ability to create a different sort of society. This will include building unions as fighting organisations of working people. It will mean radically expanding union coverage amongst the 90% of private sector workers who don’t have unions. It will mean workers in the state sector challenging the bureaucratic, hierarchical organisation of their labour so they can deliver real services that people need and it will mean winning majorities in parliament committed to a programme of radical social change. But it will also mean looking at how we can create people’s power in the cities, towns, and villages that exist today.